Concierge Services are still budding in Nigeria despite their increasing popularity among businesses and individuals alike globally. In the United States, small business and start-ups are taking advantage of these companies’ services which normally encompass assistance in hotels, apartments, and office buildings for personal services, making arrangements, assisting with acquiring business services, housekeeping, and maintenance and lots more to cut down on operational costs. 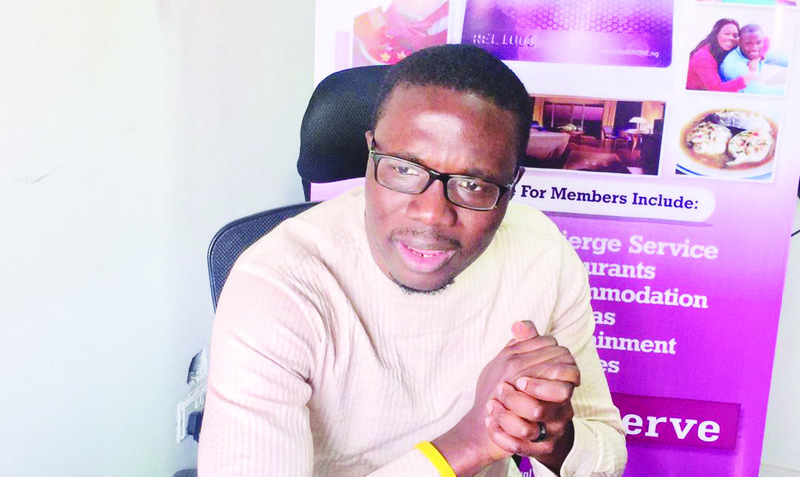 CHIBBY OBIANYOR, founder and chief executive officer of Relish One, a lifestyle and concierge company, met with business a.m.’s NSE ANTHONY-UKO in Abuja for this interview where he provided insights into this niche business, its potential as a business and how Relish One plans to push the boundaries for the lifestyle and concierge sector in Nigeria. Not so many people in Nigeria quite understand the nature of services delivered by businesses in the concierge sector, even though such services are well established in many parts of the Western world. What exactly is the nature of the services offered by your company and others in the concierge business? R elish One is a lifestyle and concierge services provider. The lifestyle focuses on helping people save money while they do things that bring joy to them and in that area we look at things like eating, dining. Through a Relish One membership you will get discount from the eateries when you dine out, you get discount from your hotel stay, spas, cinemas and things like that. That is for lifestyle. The other bit being concierge is focused on saving time. So lifestyle saves you money while concierge saves you time and helping with efficiency. Concierge is helping out with errands, not just simple A to B errands, where you could put a phone in a taxi here and tell it to take it to a different location, that’s pretty straightforward. Here, we are looking at that and more specific errands. For instance, you need to have something picked up in Maitama, Abuja and delivered to someone in Lekki, Lagos. And on the way to Lekki you need it to be wrapped in Bubble Wrap and roses attached to it. That sort of multi-faceted request and fine-tuned to the barest detail, is what we handle for you through a Relish One membership. We were asked at some point to provide seven black Toyota Camry cars for an event. The person was outside of Nigeria, and we had to do that. Now coupled together, the idea of this is to be able to provide a business or individual with these services. So it’s all about saving time and saving money. Concierge Services appears ‘elitist’. Are there ways that the average person can enjoy these services? It is definitely not elitist. But yes, it’s not something that would come to mind for everybody. No more than having a car is elitist, but everybody doesn’t have a car though it actually serves a benefit. When you can, you really would want to have a car because it would make your life easier. So, concierge services are very similar. It’s not targeted at the rich per se. In Nigeria, for instance, the rich are not really bothered about discounts. Sometimes, they don’t even know who is paying their bills. Our target is that very slim middle to upper middle class that Nigeria is described as having. It is where we are focusing on to groom. It’s important for us to get a foothold in that market. Who are the people who need to get things done but are too busy to get out of the office? A typical person that comes to mind would be a bank worker, not elite per se, but in that middle class and they don’t have that luxury of time to run around for little errands. For instance, I am at the office in Garki and I need to pick up something in Utako [both in Abuja], they don’t get that kind of lunch break. That is the kind of person who would require this kind of service. Or you think of a bank worker who is getting married. What amount of time would he/she actually have to run around to make the arrangements? This is where the concierge services come in. Alongside things like these is being able to eat out, go to restaurants. You may eat at your local diner but once in a while you want to eat out, or go swimming, play some sports. So it’s targeted at the middle class and not at the elite. You talk in terms of membership, so I reckon this is not some service that you jump in and pick up off the shelf. What sort of packages do they come in? We are looking at somewhere around N5,000 to N10,000 a month. A lot of people tend to focus more on cost but I like to stress on value. Let me highlight the value you can get from the N5,000 membership. You purchase a Relish One membership, you are an entrepreneur, and you just started a side business in addition to your paid job. You can’t be in two places at the same time. When you are at the office you need someone to monitor your business. You could actually hire a full time person to help you monitor that business or you could use your Relish One membership to track some of those costs. Your Relish One membership can handle the basic form on accounting for you. Any expenses you make or revenues that come in there is a service in Relish One membership that you can use and at the end of the month, Relish One would tally that for you. It saves you the cost of hiring an on-hand accountant. At the end of the month you might still need someone to file your VAT, Relish One could still do that for you. So if you think of the cost of having an employee, what is the minimum wage now, N18,000 a month and labour is fighting to get it up to N30,000. Your Relish One membership could actually serve part of the job at your business. How many people can get a competent person for N5,000 a month? That’s where the value of your Relish One membership comes in. Are there extra charges for the services you perform, besides the membership fees? It depends on the kind of services you want done. If it is just tracking costs, that comes as part of the membership. If it is doing price research, like the example I gave about providing seven black Toyota Camry cars, that is actually part of the membership, so you don’t need to pay any additional cost. If you needed somebody to physically go and look at, say a property or something, the transportation cost would actually be an additional cost from your membership. And you would still incur this cost if you had anyone else go do it for you. It depends on what the activity is. But in terms of research and information, if it can be done while sitting in the office its actually part of the membership, we would not charge any additional cost. All of these benefits come alongside being able to get a discount in hotels, restaurants, spas and so on. This past week we had some members stay at Eko Hotel and Suites for four nights and off each night they were saving up to N40,000. That adds up to N160,000 which is already more than their annual membership of N120,000 at N10,000 per month. At Eko Hotel, a Relish One member would get up to 40 per cent discount. Relish One membership offers immense value beyond the N5,000 to N10,000 fee. What has been the level of acceptance and patronage since you started? We registered the company in 2015 and we started operating in 2016. It was an interesting thing because while we talked of providing discounts, the discounts were on services that people considered as luxury in the difficult times. That made our start a ‘baptism of fire’ I daresay. It’s been a tough climate for business, particularly our type of business. Enlightening people about the value we provide has been the toughest part of the business. Even if you rented a billboard how do you explain what we do for people to understand within the 10 seconds that a car would drive pass the billboard? These are some of the challenges that we had to overcome. But when people have actually started using our cards the value is undeniable. We have a 90 per cent renewal rate. That means that out of 10 people who sign up for our services, only one does not come back to renew. We have been doing this for two years; we have six months and 12 months tenures for our membership right now. If you look at the reason for people not signing up it is actually encouraging. Not many people say, “Oh this is not for me”, they rather say some of the places you have on board are not places I like to go to as opposed to “I don’t see the point of using it.” So, that renewal rate is very encouraging and the feedback we are getting is quite positive. For instance, they are like “Oh wow this is great. It’s just that so many people don’t know about it.” That is the bit we are working on so as to increase the adoption rate. We have Zenith Bank as our member, Relish One is listed on the bank’s website and some categories of its account holders have access to our services. Who are your current partners? In the hotel space we talk about Eko Hotel and Suites in Lagos. In Abuja we have SV Chrome; Barcelona Hotel is also quite popular. There are other boutique hotels too that we partner with. In the restaurant space we have The Charcoal Grill, Wakkis Restaurant, among others. We actually do something quite interesting for our members now. We get them to experience the Relish One service and not be so selective. They get the benefit from anywhere they go to eat. As long as you can provide a receipt that you ate there they would get cash refund. If you are at a partner location you get the discount there and then, but if it’s not a partner location they bring back the receipts and we process the refund. All our partnerships are backed by legal agreements. So anywhere they go even if it is not our partners, Relish One will pay at least five per cent off your expenses. What potential for growth does your line of business have in Nigeria? There is a massive potential for growth. We pointed out that the middle class in Nigeria is no way near where it should be. In almost every other developing and developed country the middle class is the mainstay of the economy. So, as that middle class hopefully gets paid attention to in Nigeria and grows, services like ours will benefit from it because people will continue to see how useful our services are. But even as it stands the size of that market is actually decent and it is one that we can look at growing. Nigeria has the most hotels in Africa and I think New York is the only other place in the world where costs of hotel rooms, when compared to the revenues of people, are higher. When you think of that, I wouldn’t exactly say that hotels are for the lower end of the economy either. It is actually within that same bracket that we are looking at and higher. There is a lot going on there. Look at the number of cinemas and restaurants popping up all over Nigeria now, it actually shows the encouraging signs that we looked and decided that Nigeria was at a good time for us to go in. We weren’t going to wait until the terrain is perfect. We are in early; we are definitely at the front end of the curve. Not many people are in our line of business so we are going through the grooming pains, but we believe we will come out the best for our customers and for ourselves. One could easily mistake lifestyle and concierge services for something in the mode of event planning. But how are they different? I can see how it’s very similar, but I can confidently tell you that it’s not the same. We actually work with [event] planners. The concierge service complements event planning. The event planner focuses on all-round flow of the event. At a wedding, for example, the planner focuses on the couple and the guests. But there are peripheral things that are part of the larger event that don’t often see the light of day. For instance, how the Aso-ebi [traditional apparel] gets to the people who have purchased them. It’s not something that the planner typically worries about. The planner might be focused on accommodation for the couple and a few members of the family. The concierge service provider can actually get a wide range of hotels for guests coming from out of town for the event and these are already hotels that we work with so instead of the planner going to make arrangement with individual hotels, we work with the planner to have an array of hotels to use. So the concierge feature actually enhances the ability of the planner to serve the client. Again, looking at a recent event in Enugu, the planner was in Enugu focusing on the event and we had some guests coming into Nigeria for the first time two days before the event. Now, you could be a very good planner but it would be difficult for you to be focusing on the event in Enugu and trying to figure out how to ensure that clients are safe. The portion of handling the logistics of receiving the foreigners who were coming in to the country was taken care of by Relish One. We booked them into hotels in Lagos, the first day, then took them to the local airport and got them flights to actually meet up with the event the next day. The portion that just seems to be away from the event that you almost wouldn’t hear about; of course, the bride was concerned because those were her friends. And for her to be able to have that peace of mind we took care of that for her. We have the partner car services in Lagos, the partner accommodation all at the discount and that is how we complement them. Even if you don’t have the planner, you want to keep the planning within the family; Relish One services will complement you. Where you need to look for hotels, instead of going to negotiate with hotels individually you can just tie into a Relish One membership and have access to that or you can even get us to look for the things you need and come back to you with availability and pricing and so you just sit back and plan your event with ease. How has your services impacted on the tourism and hospitality sector in Nigeria? The hospitality and tourism sector is broadened. When you talk about this people just think about hotels. People come into Nigeria for business. We don’t yet have nearly enough people coming into Nigeria just to take in our culture. There is a lot of work to be done there. We are a part of that industry and we will complement its operations. And how I envisage Relish One will complement that industry is this; a lot of times people are concerned about security. There are places where backpackers travel to that country, for say two weeks and just explore, they don’t know anybody there but they just go. This is the kind of thing we would want people to come to do in Nigeria. But as it is people are so concerned about safety. This is the kind of thing we want people to be able to do here in Nigeria without fear. But people are so concerned about safety. We have Nigerians here in Lagos who are afraid to travel to the east for fear of being kidnapped. What we do in that space is to provide things like guided tours, translators when you travel. When you go to the north for business or pleasure and you are not fluent in Hausa language, we can actually have someone do that for our members. After the business meeting we can tell you what you can do that is interesting. We have produced calendars for 2019 that actually show some of the interesting services that are available. There are festivals and carnivals that take place in Nigeria; you have the Calabar carnival for instance, so many people hear about it but how can you go about attending, where can you stay? All of these concerns can actually be handled by Relish One. This is how we can complement the tourism sector. There is a long way to go. One of the services that we offer every guest we pick up in Abuja is to take them to where they can view the center of Nigeria. Katampe has a hill close to Aso Radio and on top of that hill is a marker that is the centre of Nigeria, but a lot people don’t know this. If you go there on a clear day, the views are quite beautiful, you can see the Maitama, and have a 360 degrees view and it’s quite nice. You can identify some landmarks like the National Assembly etc. so being able to take people there would add a lot of value. We are working with the ministry in the longer term to create observation desks up there with binoculars that people can come up there and look out and generating revenues from things like that would be so straightforward, once you make it something people want to see. We are in talks with an establishment in Lagos, Logobiri House. They are actually keen on getting from outside Nigeria, the Caribbeans to come in and have a cultural experience. It’s a different experience from when you come in and stay in a five star hotel so that you feel like you are back in the West. We want to work with people like that; they can come see a place like that and then go visit places that are part of the heritage of Lagos state and Nigeria. It would seem, from the places you mention, that your services are centred on Lagos and Abuja. Would this be correct? We operate a demand based service and right now, we have the most demand out of Lagos and Abuja. We do also have hotels that we partner with in Port Harcourt and Enugu. Typically, what we do is to get things sorted for our members. If you want to go to Kano, we create on the spur deals to suit your demands. For those who are travelling locally and internationally, when your flight is delayed especially when you are departing, we actually can provide airport lounge in Lagos and Abuja and in 900 airports worldwide that any of our members can access, so it means that the trip does not have to be so hectic even if your flight is delayed. You will get Wi-Fi access, you can eat and relax and this is a major benefit you derive globally. When you arrive in Nigeria we can arrange a pickup service for you. A lot of the time people tend to compare our ride with Uber service and Taxify. But from experience, you don’t know how long the Uber driver will wait for you at the airport. Sometimes the flight may have to wait for up to four to five hours but our driver will wait for you. It is that guaranteed service that people have come to value with Relish One. You can gift the Relish One card to anyone. How many countries are you located? We cover over 40 countries in all of the popular places that people from Nigeria travel to. All the carriers in Nigeria, wherever they travel to we have a lounge in those locations. We have lounges in any airport in United States, UK, France, and Germany; and in Africa as well, Tanzania, Kenya, South Africa. Going out to China, Australia we have lounges there. We have lounges in all the major travel hubs for business and leisure from Nigeria. How do you want to distinguish Relish One from other similar companies? The support that we give, the target that we have, basically make us stand out. We are not elitist. Other concierge services focus on the ‘big people’ to cater to their needs especially when they travel outside the country. We have broadened that. We are out to provide services to a wider range of people and our major focus is on what we can do for you here in Nigeria. While others focus on providing concierge services internationally, we are focused on bringing people into Nigeria. Our focus is on inbound traffic. You may be resident in the U.K., but you may have a family friend and loved ones in Nigeria and it is where Relish One membership comes in. We have members who are abroad and have relatives here and we are supporting them in paying school fees, and helping them work around logistics. Not having lived in Nigeria they don’t often understand the nuances. Whether you are resident here or abroad, once you have an interest here in Nigeria, say family, business, assets, Relish One is set up to serve you. We want to bring what Nigerians enjoy in other countries back home to Nigeria. What was your motivation in starting Relish One? First there was an obvious need that I identified because myself and a number of my friends had struggled with getting things done because we didn’t have the time to do them. A lot of the times we were accepting substandard level of work because we could not get it done ourselves. You get people to do things for you if it goes wrong you can’t complain because they are doing you a favour. I felt we could do better. So I grew up in Nigeria, then went to U.K. to study and started working in investment banking. I used to have a lot of things I wanted to get done in Nigeria, investments to make, a lot of the time family members were telling you it’s fine but you know they were taking a lot out of their day and time to do this for you and you find yourself being restricted on things you want to ask them to do. If you had a minor thing to check out, you were reluctant to ask them to help out. And I found myself not being able to do these things. That is how I came about the concierge services, and like I said, our focus is on value and efficiency. Then we thought, apart from efficiency what else can we do? That is how the lifestyle concept came about and we decided to combine both for added value. There was a gap and I came in to fill it. What are your expansion plans? In the long term we want to be able to expand, but the focus of our expansion will be Africa. The services we are providing for Nigerians, there are Africans from Ghana, South Africa, Kenya etc living in other parts of the world who require them back home in their countries. So there is a path that we are looking at. We started up in Nigeria, then Lagos, Port Harcourt, we will continue to grow and expand internationally. But our key goal in the expansion is to ensure that the requirements for Africa are catered to. We don’t want to end up being a U.K or USA hotel booking company. I believe that sector is well served by a lot of competent companies. We want to see how we can provide value and ensure that a lot of the monies that have taken flight from Africa actually come back. A lot of Africans live abroad; we want to encourage them to not be afraid and come back home to invest and do business. When they come we can use the concierge services to give them soft landing while they go on and do whatever business they have back home. That way our services can actually help to boost Nigeria’s and Africa’s foreign direct investment. Where do you envisage to be in the next five to ten years? In the next five to ten years we want to be identified as a key player in supporting businesses in Nigeria, particularly, for those here and abroad. Abroad by managing their investments here, helping them with errands and ensure that they can conduct businesses that they didn’t feel comfortable conducting back home before. [It is] as simple as purchasing a property. How do you know who you can trust? Do you have to come back home each time you want to purchase a property? And even if you do come back, do you have to go to all the relevant agencies yourself or are there some parts of those errands that you can outsource? Internationally, you can purchase property abroad without seeing the property. You can purchase shares in a hotel, in U.K. where I am quite conversant with you can own an hotel room without having ever visited that hotel and get yield on it. Locally even, being able to free up people’s time so they can do the things that are more important and more valuable to them. We want to take away the perceived burdens, the minor tasks. There is the advent of online shopping for groceries and things like that and there is so much you can get done without necessarily doing it yourself or being physically present. In five years we want to manage the lifestyle of people here and abroad so that their time is stress free. We want to be the go to lifestyle and concierge services company in Nigeria in the next years, and Africa in the next 10 years. What can be done to fast track the growth of concierge services in Nigeria? I would say collaboration. The concept of public private partnerships, the ideas that can come out of those arrangements are quite immense. Relish One is actually founded on collaboration. We don’t own hotels or airport lounges, we just provide the link. We provide a central location, making it easier for these things to be accessed. To move further on that, I think the more ease we can create in linking as many things as possible the easier life will be for all, citizens, customers, those who want to come to Nigeria. The hospitality industry can encourage the partnership that we need to have. Right now maybe for security reasons it is not encouraging if you went to the Ecumenical Centre in Abuja, you actually can’t just walk in and admire the beautiful architecture whereas, St Paul’s in the U.K. and other popular cathedrals you can almost walk in there, it’s open to the public. I went there once with Japanese citizens and they asked me to bring a letter from the Japanese Embassy confirming that the person was actually a Japanese citizen and for how long they were in Nigeria for. For them to see architecture? It was so discouraging. I think that is what the government can do, they can partner with hotels to make it easy for customers of the hotel, whether they come in for business or pleasure, to access services like this. The hotels may not be running a tour but they can encourage businesses like ours to have flyers on the hotel table, for customers, so that as they check in they can see a list of things to do in Nigeria; you don’t have to go online. Sometimes it happens on impulse, you sat in the hotel lobby, free time in the next two hours you can actually go see the Centre of Nigeria, why not? As opposed to seeing everyone as competition, we need to work together. The government is doing a lot in that space, things like tax rebate for businesses in niche sectors, they are promoting a lot of manufacturing right now. But for businesses like tourism it’s not popular, it almost as if they are turning a blind eye to that sector. Tax rebate in this sector will also help to do a lot more of what we know can ensure the long term benefit for all.